On Saturday I visited Frost Burgers Liverpool just a couple of weeks after it opened. 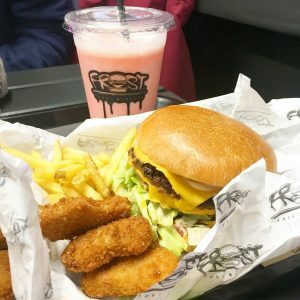 A flyer came in my Vegan Kind subscription box and since we had some Christmas shopping to do we thought we’d spend the day in Liverpool and get some food at Frost Burgers while we were there. I was super excited because I’d seen photos on their Instagram and was drooling over them and I’d already looked at the menu for half an hour and decided what I wanted to try. It’s really close to all the main shopping in Liverpool and was pretty easy to find (we did go down the wrong street once before we realised we should be on the adjacent street). It was quite busy when we got there. We were second in the queue but all the tables were full. It was nice to see it busy and popular so soon after opening. In fact I heard that they actually sold out of burgers on Saturday and had none left to sell on Sunday! By the time we got our food there was room for us to sit. I ordered a beef free burger with a strawberry milkshake and ‘Frost bites’ which are like chickenless nuggets. Billy had the beef free burger without cheese as part of a meal deal which came with fries and a can of drink. You get a free sauce with the fries and frost bites so we had honey mustard mayo and garlic mayo. They were both amazing but the garlic mayo was my fav! I’ve tried vegan garlic mayo before and it was weird and I wouldn’t try that brand again but this one was just like normal mayo. I bet you wouldn’t be able to tell the difference. The frost bites were amazing. I don’t know how you get the middle to look like chicken but they manage it! It was especially nice dunked into the mayo. The fries were also tasty. We shared the fries and frost bites so we only had half a portion of fries each and there was plenty to share. The beef free burger had two burger patties with cheese in between, red onion, tomato, gherkins, lettuce, more cheese and sauce including a mustardy sauce. 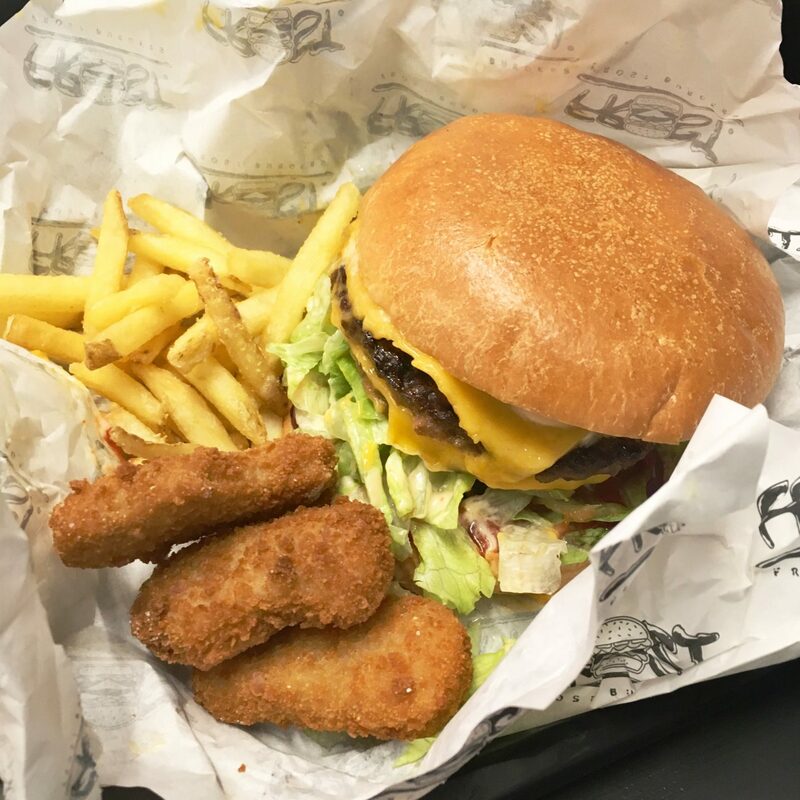 It was massive so I struggled to get a bite of everything (not saying it’s a bad thing it was massive but I had to do a lot of reconstructing every now and then to get all the bits back in the burger. I really liked the whole burger but it was very messy. Billy liked the burger but he doesn’t really like sauce so it was a bit too much sauce for him. He still ate the whole thing though so it must have been pretty good! Last but not least was my milkshake. I used to love milkshakes. Sometimes we’d go to Mcdonalds drive through just to get a chocolate milkshake. That’s how much I loved them. I’ve never quite found one as good until Saturday. As well as strawberry you can have vanilla or chocolate and it’s made with their very own soft serve (available in a cone). It was so delicious. I loved the flavour and the creaminess. They also do cookies if you have room after your meal. We spent about £25 between the two of us because we wanted to try a bit of lots of things but the prices are very reasonable. Burgers cost £6.95 and are very filling by themselves and you can get a meal deal for £9.95 or a cheeseburger costs £3.95 with its own meal deal for £5.95 which is a good offer. My favourite part was the frost bites with the mayos and the strawberry milkshake. I also loved that they use paper straws and all drinks including water come in cans which you then crush yourself to recycle. I believe the milkshake cups and sauce pots are made from plants too! 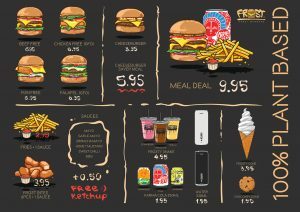 Next time I visit Frost Burgers Liverpool I think I’d have the frost bites with a side of fries or maybe try the cheeseburger meal deal. These look great! Love the sound of the Frosts bites!